Written circa 1645, The Book of Five Rings is considered a classic treaty on military strategy, much like Sun Tzu’s The Art of War. The author Miyamoto Musashi was a samurai warrior and he wrote the text on his expert teachings of kenjutsu (the art of the sword) and the martial arts in general. Here, Musashi’s text is interpreted for the modern day world and offers 52 simple – yet powerful – and proven techniques to help deal with conflict that can be applied to business, career and home life. Leo Gough’s interpretation of Musashi’s work illustrates the timeless nature of his insights by bringing them to life through modern case studies. 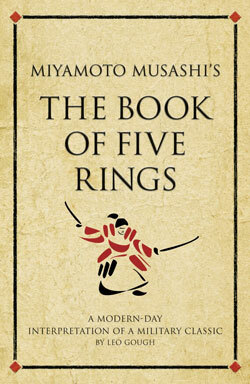 This brilliant interpretation of The Book of Five Rings is an entertaining accompaniment to one of the most famous books on military strategy ever written.